Rating: **** BOUTIQUE Hotels. 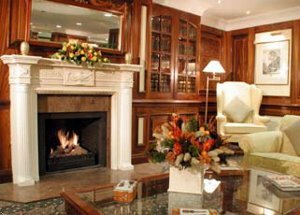 Smaller hotels with their own distinct personality, located in very special, superbly located buildings, in some cases ancient palaces, renovated castles or convents. Luxury facilities and the work of the finest interior designers. The hotel is located right in the heart of the commercial district of Brussels, only 10 minutes away from the historical city centre, with the Grand Place and the famous Manneken Pis, between Avenue Louise and Boulevard of Waterloo, with exclusive shops and important companies. The international airport is 20 minutes away. Retreat to your guestroom decorated in a traditional English decor with comfortable furnishings for true relaxation. 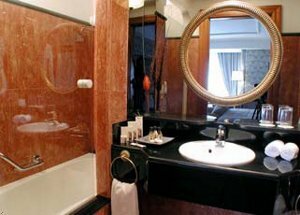 The Hotel offers 80 comfortable rooms divided into 31 single, 25 superior and 24 executive rooms. All of them include a private bathroom with hair-dryer, satellite TV, 3 telephones, individual fax and modem connection, mini-bar and electronic key card. The hotel also has a varied breaksfast buffet, a bar, as well as 1 meeting room for up to 45 guests. 80 comfortable rooms, including 31 singles, 25 superior and 24 executives rooms, are at your disposition. All of the rooms have a private bathroom with hair-dryer, satellite TV, 3 telephones, individual fax and modem connection, mini-bar and electronic key card. 25 superior rooms. All the rooms have a private bathroom with hair-dryer, satellite TV, 3 telephones, individual fax and modem connection, mini-bar and electronic key card. Safe in Room. Room Service. Extra bed is not allowed in this kind of room. 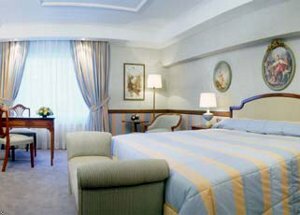 DELUXE room type consists of one or more rooms of the following type: * SUPERIOR ROOM. 2 PEOPLE. Driving directions from Brussels National Airport: On the ring road from the airport, take the Brussels exit, direction "Bruxelles Centre/Brussel Centrum". After several tunnels you will arrive at Rue de la Loi. Follow directions for "Mons-Bergen". After approximately 2 km, take the exit for "Louise". At the roundabout take the left turn and continue on Avenue Louise as far as Place Stephanie. Keep to the right-hand side of Avenue Louise (do not enter the tunnel). Rue Blanche is the 2nd street on your right. From Paris: go towards west Brussels and keep on the ring road. Go out at "Brussels Koelberg" and go on until you find the Basilique. Take the tunnel, proceed towards the city centre and take the exit "Louise". At the roundabout turn left and continue straight ahead until you get to Place Stephanie. Take Avenue Luise and, keeping the right lane, turn into Rue Blanche, the second street on your right. In our restaurant you can enjoy a varied breakfast buffet as well as you can find the bar. Do not miss the remarkable Town Hall with the famous Manneken Pis between Avenue Louise street and Boulevard of Waterloo street,, the quaint guild houses, St. Michael cathedral, the Congress column and the Heyseldistrict with its world-famous Atomium. The capital city of Belgium is situated right in the heart of Europe and gives the opportunity to discover many neighbour countries with unforgettable short breaks. Visit this unique town and enjoy one guided tour by boat: it will surprise you with its impressive old houses and picturesque bridges. Famous for the battle which took place there on the18th of June 1815. Antwerp, located on the Schelt river, is the second biggest city of the country. It is absolutely worth a detailed visit: it has many different facets and spots to discover. The hotel has an exclusive buffet breakfast where you will find a personalized and careful service. Parking available in our hotel. The hotel offers a fully equipped meeting room for up to 45 guests.